Israeli riot police officers operate in the Arab neighborhood of Issawiyeh in Jerusalem, Oct. 20, 2015. U.S. Secretary of State John Kerry will be in Berlin Thursday for a meeting with Israeli Prime Minister Benjamin Netanyahu to look for concrete ways to end violence that has killed eight Israelis and nearly 50 Palestinians. "What we'd like to see are steps being taken, whether they're in word or deed, to reduce the tensions, to try to restore some calm, and to end this terrible violence," State Department spokesman John Kirby said Wednesday. Kerry also plans to talk with Palestinian President Mahmoud Abbas in Jordan at the end of the week. U.N. Secretary-General Ban Ki-moon said Wednesday that he was "not optimistic" after his talks with the Israeli and Palestinian leaders. He urged both sides to pull back from the brink of what he said could erupt into a full-blown Palestinian uprising. United Nations Secretary-General Ban Ki-moon, left, and Israeli Prime Minister Benjamin Netanyahu, arrive to a press conference at the Prime Minister’s office in Jerusalem, Oct. 20, 2015. "We will continue to support all efforts to create the conditions to make meaningful negotiations possible," Ban said after meeting with Abbas in the West Bank town of Ramallah. "Our most urgent challenge is to stop the current wave of violence and avoid any further loss of life," he added. As usual, both sides blame the other for the explosion of violence that started nearly a month ago when Palestinians began attacking Israeli civilians and soldiers with knives. While Kerry has avoided blaming one side or the other, he has said attacks on innocent civilians are never justified. Again Wednesday, Netanyahu said Abbas and the Palestinian leadership must stop lying about Israel — specifically, rumors that Israel is planning to take over an East Jerusalem holy site revered by both Jews and Muslims. 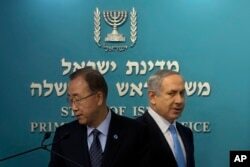 "It is very clear to us that incitement leads to terror," Netanyahu said. "The international community must demand that President Abbas stop the incitement and stop spreading the lies about the Jewish state and about Israel's policies." FILE - Israeli police stand by the shrouded body of Palestinian attacker in Beersheba, Israel, Oct. 18, 2015. Israel said it has no intention of changing the long-standing rules overseeing what Muslims call the al-Aqsa Mosque and Jews call the Temple Mount. "The continued occupation and aggression against Christian and Muslim holy sites in East Jerusalem, particularly against al-Aqsa, opens the door to a religious conflict," Abbas said Wednesday. "We don't want it, and we are warning over its consequences." The violence also stems from young Palestinians' despair about the dim outlook for peace, the lack of economic opportunity, and Israeli settlements in lands they want for a future state. Netanyahu created more controversy Wednesday when he said a former Palestinian leader, Haj Amin al-Husseini, talked Nazi dictator Adolf Hitler into slaughtering European Jews during World War II. Historians have long disputed this claim and said Husseini, while pro-Nazi, had only modest influence with Hitler. An Israeli man cleans blood stains at the scene of a stabbing attack in Beit Shemesh, central Israel, Oct. 22, 2015. Police say two Palestinians stabbed an Israeli man after attempting to board a bus ferrying children to school. Elsewhere on Wednesday, a Palestinian man was shot dead after stabbing a female Israeli soldier; a teenage Palestinian girl armed with a knife was shot and wounded when she tried to sneak into a Jewish settlement; and four Israeli soldiers were hurt when a Palestinian ran them down with a car. Also, there was a memorial service in Tel Aviv for Habtom Zerhom, an Eritrean migrant who was shot by police and beaten by a mob. The Israelis mistook him for a second gunman during Sunday's bus station attack by an Arab in Beersheba. An Israeli soldier was killed and 10 people were wounded in that attack. Zerhom later died of his wounds. Netanyahu decried his death and appealed to Israelis not to take the law into their own hands.